Etymology: Perhaps < Welsh gŵylan, Cornish guilan = Breton goelann (whence French goëland), Old Irish foilenn (modern Irish faoileann) < Old Celtic *voilenno-; compare Breton goelaff to weep. "Yr wylan deg ar lanw, dioer ..."
The poet Dafydd ap Gwilym wrote his famous poem to the seagull in the fourteenth century. It's really not about the seagull, of course, but about the lady to whom the gull is free to fly, whereas he is not. Centuries later, the gull is an all-too-familiar presence in Wales, including in inner Cardiff, and for a few weeks this summer we had the mixed pleasure of finding ourselves living in a seagull nursery, as after an absence of some years a gull pair decided that our street, with its high but unused Edwardian chimney pots, is an ideal place for the rearing of seagull young (it isn't). The first high pitched cries of the young chick were heard at the beginning of June, and a tiny head could be seen sticking out on the roof of a neighbour's house. So far, so good: however, seagull chicks hatch apparently already able to walk, but unable to fly, and the tiny amount of space among the chimney pots is wholly inadequate for the next stage. Sure enough, very soon the small fluffy one had reached the ground (how? do they just float down somehow?) and was now in someone's back garden, with its parent still settled on the roof, about 30' higher up. In no time at all, it found its way out of the back garden (where it was safe from cars but not from cats) and eventually round to the busy street, where it took up residence, mainly sitting in the gutter, on the pavement, and in the road. 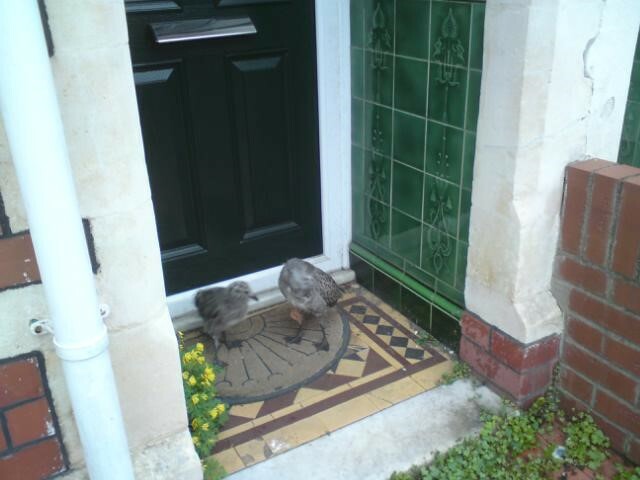 Having had an unsuccessful episode of seagull rearing in the street before, we knew more or less what to expect - but I had certainly forgotten aspects of human behaviour which gulls inspire (even small fluffy brown ones which look more like ducklings). At a rough guess, I would say that the country is divided absolutely and forever on the subject of seagulls, rather like Brexit. 48% of us seem to be able to co-exist with them, whereas the other 52% really hate them. The internet is full of rants about seagulls and suggestions for getting rid of them: firms offer (illegally) to exterminate chicks. The press regularly carries stories about gull-on-human attacks (I won't name names for likely newspapers, but let's just say there seems to be a common thread here: think, fear - whether of groups of "other" people, various, or wild birds or animals. Squirrels come in for quite a bit of negative attention too). Seagulls are noisy, they make a mess on your laundry, head and car, and they will swoop at you if they perceive you as a threat, but they do not, in fact, usually actually attack you. They don't like small dogs, small children, or men in hard hats. The presence of a chick in the vicinity ups the likelihood of diving, and it seems that many people do not recognise the young for what they are and do not realise that the big white bird is angry because they are going too close to an apparently unrelated brown one. However much you might dislike wildlife in general, and this sort in particular, chicks and birds with young should be left well alone. They are protected by law, and you not liking them isn't a good enough reason for disturbing them. (There's more information about the legal position here). It's not easy to identify the young ones but after observing the adults I think ours are lesser black-backed gulls (so, not particularly endangered, but their numbers are falling). Not in the OED! but gulls definitely communicate with each other and have a number of different cries which, living right in the middle of them, we found we were getting to know. There's a quacking, which sometimes seems to be a gentle alert (e.g. from the parent to the chick, if I left the house - just to let him know that someone was coming, but not a full-on warning of danger); the cries with which they maintain contact with each other; the full head-thrown-back shout; the very high-pitched and insistent sound which the chicks make; and the quite different sounds the adults make when there is immediate danger or threat (partly distress and partly intimidation). We soon learned to recognise, and respond to, this one, as it is quite different from usual gull talk. During the next few weeks we had our sleep disturbed late at night by the terrible cacophony of one of the adult birds as two men who were old enough to know better danced around in the road throwing sticks and stones at it and tried to catch it as it swooped - possibly unaware of the nearby chick, of course, but FFS! (as they say) - quite apart from unnecessary provocation, how about some consideration for people trying to get to sleep? On another evening the same noise turned out to be reaction to a boy of around 13 stalking the chick with a huge stick, also quite late at night. I spent some time talking to him and eventually, reluctantly, he gave up, insisting that "I'm not going to hurt it" (huh? what was the big stick for then?). Seagulls seem to settle down for the night at around 10 p.m., unless people are throwing things at them or threatening their young. Not everyone hates seagulls, but those who don't can be a bit of a threat too, unintentionally: some people want to take the chicks away and "save" them, but even though one has to agree that a busy urban street is a bad place for a chick, removing it from its parent is not a good idea. (The parents tend to stay up on the rooftops and don't spend very much time down on the ground with the young, but if you are at close quarters with them you will know that the chick has not been abandoned. Feeding often takes place last thing at night or early in the morning). I ended up having a long chat with a nice lady with a lidded bucket who wanted to take the chick to a vet. "He is being attacked by the other seagulls", she said. (No, they are attacking you because you are trying to take their baby away in a bucket ...) Amazingly she accepted my point and the chick stayed put under the watchful eye of the parents. About two weeks after arriving on the ground, the chick was joined by another, smaller chick. We guessed that they were from the same nest but not the same age. It was at this point that even the hardest anti-gull heart would begin to melt - surely? - because it became obvious that the two liked each other's company and that gull chicks are probably never meant to be on their own on the ground waiting to fledge. The bigger one looked to sentimental humans like a proud older brother showing his younger sibling his new school. They waddled around everywhere together, snuggled up to each other to sleep, and started doing sensible things like spending the night on doorsteps (instead of in the road). Sadly, the big brother wasn't able to prevent the little one from wandering out under the wheels of a van pulling away from its parking spot a few days later. It was interesting, if distressing, to watch the reaction of the survivor, and its parent whom it summoned: again, while not wishing to be super-anthropomorphic about it and ascribing human emotions to birds of, presumably, very little brain, both birds displayed agitation and then what seemed like grief, bending their heads down so that their beaks were vertical to the ground and staying motionless like that for a short while.The adult flew off, low, but the chick wandered about with its head down for days, going back every now and then to look at the remains and even moving the dead one off the road. Just a few days later, one morning we saw the chick sitting on a gatepost, having finally got off the ground (earlier attempts were funny to watch - jumping up and down on the spot flapping its wings), and a few days later still he was seen flying low over the road, as if it were the sea. In fact I wondered whether the gulls think of the road as a version of the sea, as the young one also tried several times to settle down right in the middle for the night. It had not yet had the chance to experience landing on water, yet its behaviour around the water put out for it to drink suggested that it wanted to get in. We did not put any food out for it, reckoning that it seemed to be growing without it and, however gross we found the regurgitative process by which the adult transfers food to its young, felt that they probably knew what they were doing. The silence in the street on the Sunday morning after seeing the chick flying along the road was eerie and unnerving. Early in the morning we had heard a great deal of seagull vocalising, high up above the street rather than close at hand, but could see nothing. There was no sign of any of the group, and for several days it stayed like that (not wholly quiet, in fact: the magpies and crows which had been keeping a low profile soon started to reappear). This time, at least, there was no mangled feathery corpse anywhere to be seen. The absence of seagull noise made me realise how much their sounds had become the background to everything, and also how alert we had been made by them, looking out all the time for dangers, chasing the chick out of the road, and so on. We convinced ourselves that the chick had flown (although I did start to wonder about sparrowhawks, which have been seen in inner Cardiff preying on smaller birds). Nearly a week later, the family returned, parents back on their usual chimneypots and - yes - the fully fledged brown juvenile seagull up there on the roof with them. I felt as proud as if I had taught him to fly myself! They are still visiting occasionally (especially on bin day) but seem to be spending most of their time elsewhere. The young one's cry is still the insistent high-pitched shriek of the young, and he is a bit clumsy landing on the roof, but he has otherwise mastered his beautiful brown wings and soars above the rooftops. While the adults do come down to the ground the young one hardly ever does. I wish the other little one could have joined him up there, having spotted a few other more complete family groups with young ones sociably sticking together, but at least he made it in spite of all the odds. Once upon a time, British registered cars produced hours of harmless fun on long car journeys. Anyone else remember the numberplate game? The old system was replaced in September 2001, a few months before my son was born, and my first thought was They Have Spoiled The Game! Surely it would soon become impossible to play, as older cars disappeared from the roads. Not only that, a few years later the government introduced a scrappage scheme intended to boost the sales of new cars by encouraging people to part with their old ones. I therefore didn't attempt to play the game with my own child. The new registration scheme doesn't lend itself to any very obvious equivalent, as although it has been in place for over 14 years there is quite a limited range of numbers (so far, only 02-15 and 51-65). The previous sequence with prefixes A-Y ran from 1983 to 2001, and before that there was a sequence with suffixes, from 1963 (ish) to 1982. Earlier than that there were also plates with up to three numbers. On a longish walk down a busy road a few weeks ago for some reason the game popped into my head, and I noticed that many of the cars passing me had pre-2001 plates. I started wondering whether it would still be possible to play the game after all (surely not? How many people have cars that are over 14 years old? OK, I do, but surely it isn't typical?) I then had a little bet with myself, that if I should happen to see an old car with a number 1 I would start again and see how far I could get. Within ten minutes I had seen 1, 2, 3 and 4, in that order. Do not make bets with yourself. I don't know that I am really obsessive enough to carry on with this all the way to 999, but observations over the past few weeks have led to some surprises. There really are lots of old cars still on the road. Why? Is it a Cardiff thing? Is it just that the economic recovery hasn't reached Cardiff? Do we have better car mechanics than other places? Is it that people may be in work, so have the money to run a car, but are not affluent enough to borrow money for new cars or to buy them outright? A stroll around my neighbourhood revealed over 100 pre-2001 registered cars, with a surprising number of those coming from the pre-1983 sequence. There are even a few which predate the A-Y suffixes, so these vehicles are over 50 years old. Some of them are the classic makes which clearly really do last, but others are not so obviously so (although it is not a bad guide to which manufacturers are good!) I am certainly not going to feel so self-conscious about my own old car in future. While there are, as you might expect, older cars in down-at-heel areas, you will also find them in some more comfortably-off districts, perhaps because there are elderly drivers there who are not quite ready to stop driving altogether but think it is not worthwhile to invest in a new car. In some streets you will pass a row of cars in which all or nearly all are over 14 years old. There are some exceptions (personalised numberplates, or people who have chosen to keep a favourite number from car to car, so the car is not as old as its registration makes it appear) but even so, it's obvious that many people do not change their car at anything like the rate which car manufacturers might hope for. How do they keep going at all, if Cardiff is typical? The game is really just a harmless pastime, but it does have the side-effect of making you quite observant. Woe to anyone who commits a crime if their car happens to have a number close to one someone playing the game is looking for (although you might feel a bit silly confessing - "Yes, I'm sure the number was 121, I remember because I've been looking for 120 for days and it was annoying seeing the next one"). As far as I can remember, the rate of spotting numbers is not dissimilar to what it was back in the 1970s. More cars on the roads compensate for the new ones which don't count. I haven't given up yet - a month-long wait for one number nearly made me forget the whole thing, but yesterday I saw the next two numbers within seconds of each other, so I might carry on for a bit longer, and marvel at what I've discovered about the car market in the meantime. Another one to look out for. "We are returning [X] to [X]", which being interpreted seems to mean "We have successfully confiscated [X]; "We have changed the ownership of [X] to something which it never was"; "We have altered things to how we would like them to be". The use of "return", which actually means "give back", is designed to make you feel that justice is somehow being done and a wrong is being put right. Increasingly it is being used not to indicate this, but to indicate a change in which in fact something is happening for the very first time ever. Please don't be taken in! Or, to pick a local example, this rather lazy headline from the Western Mail: "It will be very nice to enjoy it as a residential area again" - from which anyone who didn't know the area might imagine that the houses came first and were there for years before the evil council put a tip next door (in fact, the tip used to be three times the size, and it was there before the houses were built: anyone moving there must have already known about the tip). Before the tip, the area was scrubby woodland. I have the feeling that there will be many more examples of this sneaky rewriting of history. Beware the words "returned" and "again" - at the very least, ask what is the similarity between the modern version of anything and its supposed original state, that's the one it is being "returned" to "again". This year, next year, some time, never? Some publishers seem to announce titles a very long way ahead of the proposed date of publication. I'm guessing this is in part a way of marking out the territory (look, we have someone working on this subject, so don't you aspiring authors/competing academics start getting ideas about writing about it!) Perhaps sometimes all the intentions are good, but the author just can't quite make the leap from proposal to actual book. 2. If you do announce a title knowing it is far from seeing the light of day, please don't give fictitious dates of publication, and raise false expectations. Do publishers do this in order to gauge interest? Does the publication of a title perhaps even depend on advance orders? 3. Sometimes, of course, things don't go according to plan. If the author is going to miss a deadline - perhaps more than one - just be realistic! If it's an interesting subject, we still want it - but we really don't want to have to keep checking publication dates, perhaps deleting and reinstating orders, or have to persuade eager readers that the book they have been told was being published in the autumn does not yet exist. 1. It would be very very nice if you could keep your publication information up to date, and not make it sound as if your latest work is about to appear, when you must know that that is not going to happen very soon. 2. If you want to put the latest title of a fellow academic on a reading list, please make sure it does actually exist in the real world and not only in a future - or possible - one. There are quite a few "ghost" academic publications out there, some of which are asked for fairly often - but they were only ever a gleam in the author's eye and never saw the light of day. The most difficult to disprove are the ones which somehow seem to have acquired an ISBN somewhere along the way - and not always a valid one! A library of all the books which were announced but never appeared perhaps exists in a parallel universe somewhere, and there are some interesting titles in it, but sadly we have to operate in a real world in which we have to satisfy our customers', and our accountants', expectations. I'm told that we have recently received details of a proposed publication with a date of 2035, and that this is definitely not a typo. Other than indicating that a project is under way, this is not really very helpful from an administrative point of view! A little realism from publishers - and academics - and perhaps authors? - would help enormously, and it would in no way affect sales: it would save a lot of wasted effort, and sometimes money, and make for better customer relations all round - unfortunately libraries are sometimes caught in the middle between the reader and the publisher. After all, we all know that deadlines are not cast in stone, especially in publishing! "I love deadlines. I love the whooshing noise they make as they go by". - Douglas Adams, The salmon of doubt. "Today’s anti-hubbers may come to look as foolish as those 19th-century segregationists and pamphleteers do to us". I think it's a fad. It isn't a recent one, of course: under another name, I first came across it as one of the ideas of Dame Shirley Porter, who was, oh younger readers, Leader of Westminster City Council, where I both worked and lived in the 1980s. Do feel free to Google her: I won't say anything more about that, other than to point out that that association might just possibly have coloured my opinion, and, again, it isn't a new idea. I think it's a fad with a purpose: to save (minute amounts of) money, to de-professionalise the staff, to take over the nicer library buildings and subvert them to another purpose, to get rid of those library buildings which are in need of investment. I think it is also an umbrella term for many different things. I've been challenged on my obvious reluctance to embrace the brave new world of hubs by one member of the library profession who says that, if library-led, a hub can be a vibrant new thing which can breathe new life into the library service. That would be great (although I have my doubts): but then I haven't seen anything like this in practice. With the right input perhaps the library model can be adapted: but, how often are these proposals library-led? and, what exactly is meant by a hub? I have been asked "what is a hub?" many times recently, by people who are puzzled by the term. In Cardiff we have just been through one of those "consultation" processes which included a page and a half of options for changing libraries into hubs, moving library services into different areas and amalgamating with other services, &c. &c.. One person said to me "I want to keep my library, but if a hub is the only option I would rather have that than nothing, but then I don't know what a hub is!" Another, who was a Welsh-speaker, assumed it was connected to the Welsh word "hybu", which means "encourage", or perhaps "inspire". If you read the Guardian article mentioned above it seems to be implying that it means having a cafe on site (the context is the Sieghart report on England's libraries). In Cardiff it seems to mean a building in which any other council functions might also take place, in particular housing or benefits advice. Cardiff has some "hubs" which do not include library services, so you could not assume that a "hub" would always have library services in it. At the moment Cardiff's libraries are in a council portfolio dealing with social issues ("Community, Development, Co-operatives, and Social Enterprise") - at least, I think that's what that means - so the proposed new "hubs" reflect that. They have also in the past been in the education portfolio (at which point it was suggested at least by one person that they should be located in schools) and, more recently, in leisure services (when it was suggested rather more frequently that libraries should be in leisure centres or swimming pools). At one point they were joined with bereavement services, although locating libraries in cemeteries mercifully doesn't seem to have occurred to anyone. In some other local authorities they are in "enterprise hubs", which are more like business information centres - which used in fact to be not uncommon in public libraries. Other ideas mooted elsewhere have included library services being run from a variety of buildings which are not part of the relevant council, such as pubs and police stations. The trouble to my mind with all of these suggestions is that I do really believe that a library should be - neutral isn't possible, but as neutral as it can be. There are lots of people who really would not want to go into a building shared with a police station or a religious institution. Plenty of people don't like the idea of going into a pub. Others would hesitate to take their children to a building which is also the main point of assistance for ex-offenders looking for help with housing: victims of circumstance the majority may be, but there will be some who are not, and surely I don't need to point out all the potential problems which might arise? It works the other way round too: if you are going to register a death, do you really want to do it in a public library, which is not only public but might be full of children having a merry time just when you least want to be confronted with that? In Kent, you might have to. Closer to home in Cardiff there are serious questions about confidentiality in those buildings which have combined a library service with social help. Where is the confidentiality, if you have a housing problem which might be caused by your domestic situation, and you are expected to broadcast this to your neighbours in the middle of a public library? The closed Ely library had no notice on it telling people that there was still a library service in the area - only a brief note to say that there was nothing worth stealing left in the building, or words to that effect. From the road, there is no clue that there is a library service inside The Hub, but at least The Hub does still provide a library service in an area where it is sorely needed (another branch library in the vicinity closed some years ago). Other "hubs" proposed are to take the place of existing libraries which will close, and are not necessarily in the same areas as those libraries. These examples are all at one end of the spectrum, but the article in the Guardian seems to be envisaging something quite different: a smart coffee shop with books. The idea of income generation has been put forward in Cardiff too. This raises one other awkward thing: the relationship of the public and private sectors. Local small businesses can be very supportive; a public facility such as a library draws customers to the area and there is a certain amount of mutual interdependence. One wonders whether that would survive the library becoming a competitor. This all might depend on the location of the library, of course. Once libraries lose their separate identity (apart perhaps from those which have successfully transformed themselves and remained under the aegis of something that is recognisably still library-controlled) they are at the mercy of the services with which they have been co-located. We have already seen this in a way in Cardiff, with local libraries which were located in small suburban shopping precincts in the 1960s and 1970s for what would have seemed at the time to be forward-looking reasons: taking the libraries to where people were, taking advantage of the footfall of the shopping centres to encourage people into the libraries, and vice versa: but as those same shopping centres declined, the libraries were left stranded and blighted with them. If the whole concept of the "hub" falls out of favour, what happens to the library services then? What happens if there is a political change in the relevant authority, which leads to different priorities? It is so easy to criticise doubters as being Luddites, opposed to change, stuck in the past, and so on. It's a very difficult charge to counter. "Change" has been the mantra of the past 30 years. People my age have not only lived through a lot of change, we are even beginning to see some of the same ideas come round again, dressed as new concepts. It would be nice if someone, occasionally, would listen to the voices of experience who already know what hasn't worked before, and why.